Posted by OromianEconomist in African Studies Association, Oromia, Oromiyaa, Oromo, Oromo Culture, Oromo Identity, Oromo Literature, Oromo Nation, Oromo Social System, Oromummaa, Prof. Muhammad Shamsaddin Megalommatis, Professor Gudrun Dahl, Safuu: the Oromo moral value and doctrine, Seera Yaayyaa Shananii, The Oromo Theory of Knowledge. Posted by OromianEconomist in Africa, Ethiopia's Colonizing Structure and the Development Problems of People of Oromia, Afar, Ogaden, Sidama, Southern Ethiopia and the Omo Valley, Humanity and Social Civilization, Kemetic Ancient African Culture, Macha & Tulama Association, Oromian Voices, Oromians Protests, Oromo and the call for justice and freedom, Oromo Culture, Oromo Diaspora, Oromo First, Oromo Identity, Oromo Nation, Oromo Social System, Oromo students movement, Oromo the Largest Nation of Africa. Human Rights violations and Genocide against the Oromo people in Ethiopia, Oromummaa, Safuu: the Oromo moral value and doctrine, Self determination, State of Oromia, Waldaa Maccaa fi Tulamaa. It is a great honor to be part of the 50th anniversary celebration of the Macha Tulama Association. For a people facing complete erasure, survival itself is a revolutionary act. The fact that we are gathered here today to honor the founding of Macha Tulama 50 years ago speaks to the fact that despite all odds, we, as a people are survivors. Ethiopian history is full of attempts to annihilate the Oromo—culturally, politically, socially, economically, in all and every ways possible. Oromos — cast as foreign, aliens to their own lands, have been the targets of the entire infrastructure of the Ethiopian state since their violent incorporation. Our identity, primarily language, religion and belief systems and cultural heritage have been the main targets of wanton destruction. Oromo and its personhood were already demonized, characterized as embodiments of all that is inferior, shameful and subhuman from the beginning. Oromo people were economically and politically exploited, dominated and alienated. Oromo cultural, political and religious institutions have been under massive attacks and dismantlement by consecutive Ethiopian governments. Oromos were rendered slaves on their own lands by a colonial land tenure system. Given the huge systematic and structural forces that have been mobilized against Oromo people and its peoplehood, it is truly astonishing that we have survived. But we have survived not by some miracle, but because our ancestors have continuously resisted violent assimilation, dehumanization, economic exploitation, and complete eradication. We have survived because our people have courageously and wisely Organized, sang, fought and sacrificed. We have survived because of brilliantly organized Oromo institutions such as Macha Tulama, which have held our communities together. For five decades, this organization has been the vanguard of the Oromo people’s struggle for freedom, liberty and autonomy. Macha Tulama was conceived at a time when Oromo people desperately needed institutions that would provide direction, leadership, and mobilize the financial, human, intellectual and creative resources to empower Oromo communities. 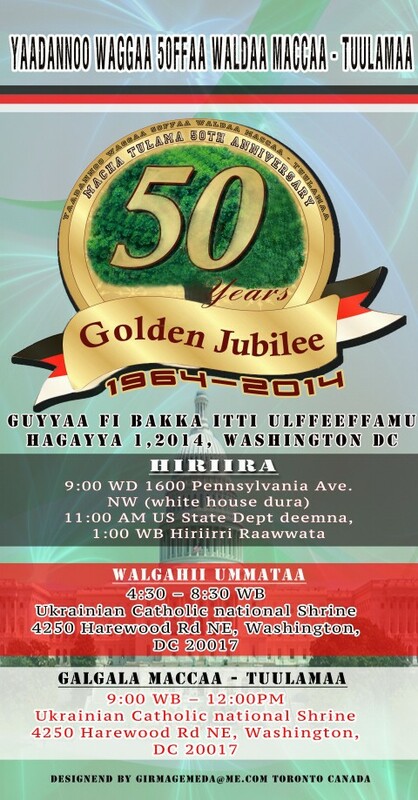 The upcoming 50th Anniversary Celebration of Macha-Tulama Association (MTA). This historic event will be held on August 1, 2014 in Washington DC. Please allow us to explain once again why this celebration will be held in Washington DC, thousands of miles away from Ethiopia. The story of the establishment of the Macha-Tulama Association was an event of great drama and wonder that has captured the imagination of the Oromo public since 1963, while its banning in 1967 is story of epic proportion which demonstrates Oromo powerlessness in Ethiopia. History of modern Ethiopia includes few cases of injustice and open discrimination equal to the banning of the first Oromo peaceful civic organization, which has come to symbolize the condition of the Oromo nation under successive Ethiopian regimes to the extent that in 2014, the Oromo who constitute the single largest national group in Ethiopia, are not allowed even to celebrate the 50th anniversary of the establishment of their oldest civic organization in their own country. The leaders of the Macha-Tulama Association came together from different parts of Oromia. They have become the symbol of courage and sacrifices that have propelled millions of Oromo into organized motion. Firm as their grasp of reality, they looked upon peaceful resistance with a boldness of imagination unsurpassed in modern Ethiopian history. What spirit was it that moved them, made them accept sufferings, torture, imprison­ment, loss of property, breakup of families and loss of life itself? Without a doubt, it was the spirit of Oromo political awakening that propelled these men and women onto a new historical stage. They became the organizational expression of Oromo national consciousness. Through their struggle and sacrifices, they won a lasting place in the hearts of the Oromo nation. Within four short years the leaders of Association not only united and provided the Oromo with central leadership, but also made them conscious of their unity and their dehumanization as second-class subjects and inspired them to be agents for their freedom and human dignity. The 50th anniversary celebration is organized for honoring the sacrifices made by the leaders and members of Macha-Tulama Association and for keeping alive the spirit of freedom and human dignity for which they struggled. Without any doubt it was the Macha-Tulama Association that planted the tree of Oromo political consciousness. The limited gains the Oromo achieved since the 1970s was the fruit from that tree of political consciousness. The Tigrayan People’s Liberation Front, which has dominated Ethiopian government since 1991, is determined to deprive the Oromo of any independent organization by banning the Macha-Tulama Association, detaining its leaders from time to time and confiscating its property, thereby demonstrating the utter absence of the rule of law in Ethiopia. We believe that you feel the pain and the daily humiliation of our people who are even denied the simplest right of celebrating the 50th anniversary of their oldest country-wide civic organization in their own country. Those of us who live in freedom beyond the tyranny of the TPLF regime have moral responsibility for supporting the celebration of the 50th anniversary of the establishment of the Macha-Tulama Association. It will give us a wonderful opportunity for informing the Western world that the Oromo and other peoples in Ethiopia are denied their basic human and democratic rights in their own country. What is greater shame for the TPLF regime that beats the empty drum of democracy than denying the Oromo the right to celebrate the 50th anniversary of their civic organization? Together, let us expose the brutality of the Ethiopian regime and lift up the spirit of our people. Now is the time for those of who are interested in freedom, democracy and the rule of law in Ethiopia to rise to the challenge of publicizing the 50th anniversary celebration so that more people will know about the tyrannical TPLF regime. · Demonstration at 9AM, gathering in front of the White House, 1600 Pennsylvania Ave NW. · Marching to US State Department, 2200 C St, NW, at 11AM – ending at 1PM. · Official Celebration at the Ukrainian Catholic National Shrine, 4250 Harewood Rd, NE, Washington, DC 20017, starting at 4:30PM. · Continuing with Oromo Cultural Evening at the Ukrainian Catholic National Shrine until midnight. Please join us so that we joyously celebrate together the 50th anniversary of the Macha-Tulama Association and demonstrate to the TPLF leaders that they will never be able to kill the spirit of freedom and human dignity that the Macha-Tulama Association planted in the heart, mind and soul of the Oromo nation. We thank you for your cooperation in this noble undertaking.